I have some MINOR ones IMO. Visitor Messages>About ME>Statistics, ect... ONE that I like is "Garage" (if they have selected it) .... can we make that one more of a priority on the list? Usually it is "hidden" at the end. Actually seeing the User's Car IS really the most important thing...can we see the car pics right away. I know this is a doufy request but why not have it more prominent on the list toward the front or? #2 - When you subscribe to a thread, can we make it a DEFAULT to go to the LAST most recent thread? Maybe you already can do that, but I cannot figure it out. ....they don't need to reconfirm as if I am hitting 'FIRE NUCLEAR MISSILE' - "ARE YOU SURE YOU WANT TO DO THAT?" #3 Do we need so many general threads and lounges? - Seems like a lot and it is confusing. Sorry for the rant, just my thoughts. Do we need so many general threads and lounges? - Seems like a lot and it is confusing. Threads are member created and there is no right number. It is usually better for someone to create a new thread instead of reviving a ten year old one. 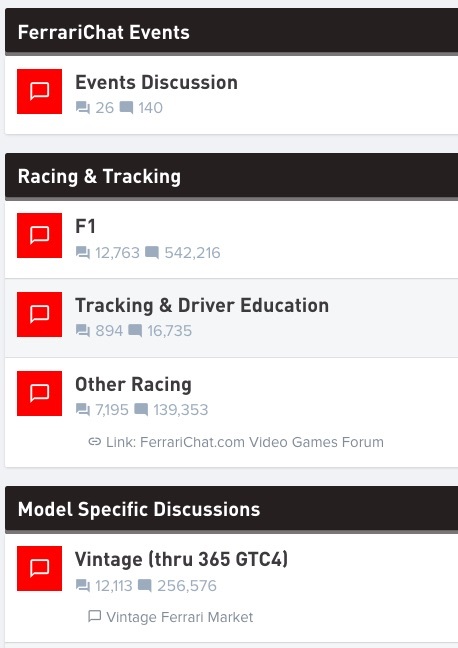 As to the various forums/lounges, the idea is to keep them somewhat focused so if a member wants to just read and discuss car stuff, they don't have to filter through a bunch of non-car related threads. Same with model separation, classic/modern etc. As mods, we can make threads sticky. We don't want to fill the first two index pages with stickies though. It is better to put them in the DIY section (even though it's labeled DYI). I try to go through every now and then and identify model specific stuff. With all in one forum, it is easier to search. If something needs to be moved there, it's very helpful if members would flag it to let us know. I would like to suggest that we have another forum for track, driver education, and racing. I believe it would be helpful to separate this out from general discussion forums and possibly further promote track use of Maseratis. I included an example pic of this done on ferrarichat. Maserati Life serves a large membership and I believe there would be enough interest to congregate track discussion in its own forum. I have done some searches and there is discussion, but it is spread among several other forums and dates. If there is additional labor involved in this, I am willing to help. I am a professor in engineering, 20year member and track driver of Porsche Club of America and have just got into Maserati. Thank you for your efforts in running this community.